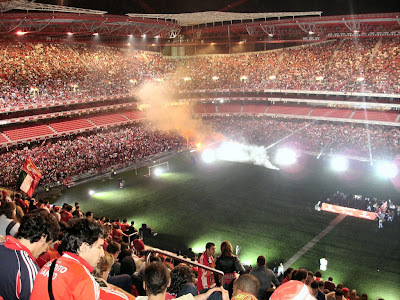 Chinmay Pandya gives The Football Front a tactical preview of Chelsea's trip to Benfica. crisis. Chelsea head to Portugal for the first leg of the CL quarter finals as they take on Benfica at the Estadio da Luz, where they have been undefeated in 39 of their last 42 home games in the Liga Sagres. Benfica had a tremendous start to their CL campaign as they managed to top their group, a run of results which saw the tournament favourites Manchester United go crashing into the Europa league. The Portuguese side managed to earn a draw both home and away to United and that too, very impressively. Their last CL game at the Estadio da Luz ended in a convincing 2-0 win over a very strong Zenit and had also managed to score 2 crucial away goals in Russia which aided their victory over the two legs. While Chelsea, who have been quite poor on the road this season which reflected in their 3-1 defeat to Napoli at the San Paolo stadium in the first knock out round. Chelsea’s defence, especially under AVB looked very shaky although after his departure, things have looked somewhat solid again at the back, which has been evident in their impressive rum of 4 straight wins before defeat against Manchester City in the league. Their dramatic win over Napoli was seen as the turning point of their miserable season Yet once again, they failed to capitalize on this momentum and ended up with back-to-back poor performances against Manchester City and Tottenham. Two late goals conceded away from home after failing to hold on to a 1-0 lead and then failing to score at home aren’t the best signs heading into this fixture. 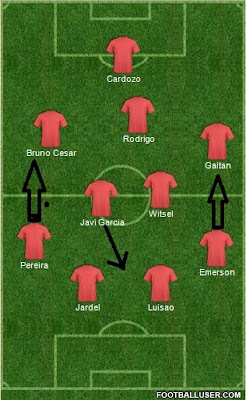 Benfica generally line up with a 4-2-3-1 formation which is quite fluid as it changes when in possession of the ball, normally to a 3-3-1-3 with the holding midfielder Javi Garcia dropping in between the two central defenders changing it into a back 3 with the wing backs pushing on and against in the knock out stages. However, it is quite different. Napoli’s back three weren’t very mobile, were very vulnerable to fast break situations and also defending crosses whipped into the box. Benfica’s back three has a lot of variety. The midfielder who drops between the central defenders is very quick across the turf, can tackle and make last ditch challenges and also provide a lot of energy in the midfield when not in possession. Luisao, the bedrock of the Benfica defence and Jardel is the weakest of the three - a weakness the Londoners should try to exploit, especially at set-pieces, as against Napoli. When in possession, the back 4 changes into a back 3, the wing backs start acting as the wingers and the positioning of Gaitan, Cesar/Aimar, Rodrigo and Witsel are very fluid. Cardozo acts as the target – man who’d be up against Terry, also very good in the air. This system, however, isn’t flawless. During fast break situations, Witsel, the only remaining Midfielder stays rooted and creates a big hole in the midfield which might mean Chelsea, with the likes of Lampard and Essien might dominate the midfield. In another situation, when Chelsea’s full backs push up, which they normally do, the game can be won or lost on the wings itself because of the spaces these full backs might leave behind. Benfica’s right wing back, Pereira is known for his goal threat and his superb service to Cardozo but is susceptible to be caught napping. A pressing game from the part of Chelsea, could prove very effective, given Benfica may lack in personnel in the centre of midfield. However, the move would not make much sense, if Rodrigo does go on to pair up with Cardozo as the latter with his raw pace could cause terror in a high Chelsea back-line. To sum up, this match could me won or lost in the midfield or the wings, as Benfica’s complicated system might leave them with less numbers in the miefield and Rodrigo’s raw pace, Witsel’s passing ability and some trickery from Gaitan might give the Chelsea backline a nightmare.